A week after Prime Minister Netanyahu’s election win last Tuesday, relations between the Obama administration and the Netanyahu aren’t getting better -- they’re getting worse. Exhibit A: White House Chief of Staff Denis McDonough’s speech to the liberal-leaning American Jewish group J Street, where he assailed Israel’s “occupation” of Palestinian territories. “An occupation that has lasted for almost 50 years must end, and the Palestinian people must have the right to live in and govern themselves in their own sovereign state,” McDonough said. Exhibit C: The Israeli government’s icy response to the WSJ story. “These allegations are utterly false. The state of Israel does not conduct espionage against the United States or Israel's other allies. The false allegations are clearly intended to undermine the strong ties between the United States and Israel and the security and intelligence relationship we share." Can anyone else remember another instance of two allies being this angry at each other? We’re having a hard time thinking of another time when two allies have been THIS angry and been THIS public about their disagreements. Talk about venom and score-settling. As with most angry disagreements between friends, it’s hard to remember who landed the first punch. In 2010, Israel announced new housing settlements -- at the same time that Vice President Joe Biden was in the country. 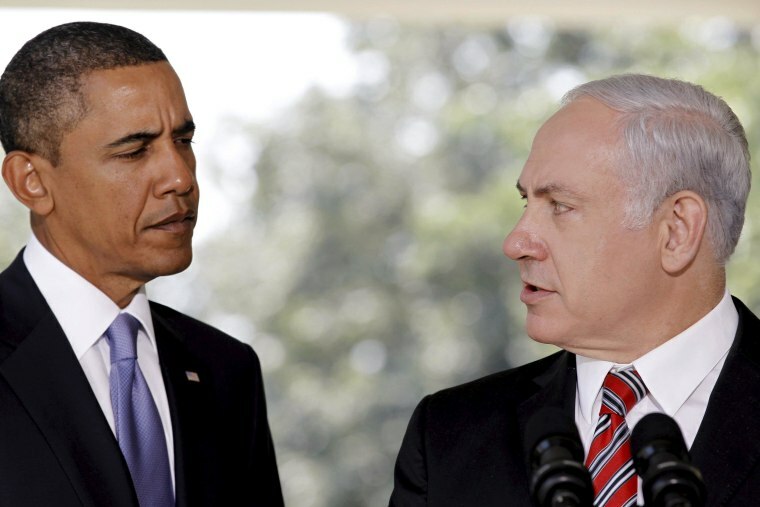 Then, just days later, President Barack Obama reportedly snubbed Netanyahu when he was visiting the White House. During the 2012 presidential race, Netanyahu implicitly -- if not openly -- backed Republican presidential nominee Mitt Romney. Last year, an unnamed Obama administration official described Netanyahu as a "chickenshit" to the Atlantic's Jeffery Goldberg when it comes to trying to achieve peace with the Palestinians. And topping it all off was Netanyahu’s speech to Congress earlier this month. By the way, you can now say that the U.S. anger at the Netanyahu government is bipartisan. Here’s former Bush 41 Secretary of State James Baker at the same J Street conference. “Blasting ‘diplomatic missteps and political gamesmanship,’ former Secretary of State James Baker laid in hard to the Israeli prime minister on Monday evening, criticizing him for an insufficient commitment to peace and an absolutist opposition to the Iran nuclear talks,” Politico writes. “Baker told the gala dinner for the left-leaning Israeli advocacy group J Street that he supported efforts to get a deal with Tehran — but he called for President Barack Obama to bring any agreement before Congress, even though he may not legally be required to do so.” As it happens, Baker is a listed foreign-policy adviser for Jeb Bush’s all-but-certain presidential campaign. Wonder if we see Jeb distance himself from Baker’s remarks. And don’t miss this: Netanyahu yesterday apologized for his pre-election remarks exhorting his supporters to go to the polls because Arab Israelis were turning out in droves. "I know that my comments from a few days ago offended Israeli Arab citizens. This was never my intent. I apologize for this,” Netanyahu said. A day after officially announcing his presidential bid, Ted Cruz -- with his wife Heidi -- appeared on “Today” to discuss the 2016 campaign. “We need to build a broad coalition … the old Reagan coalition,” Cruz said. “People are hurting, and they are looking for a change.” When NBC’s Matt Lauer asked Cruz if liberal, pro-choice, pro-gay marriage Americans could be a part of that Cruz coalition, the Texas senator answered, “Absolutely. We welcome a broad tent.” Cruz also said he was willing to compromise and take a “half a loaf” from the opposition, but then railed against compromise that grows the government – like last year’s “Crominbus” appropriations bill. Meanwhile, NBC’s Perry Bacon kicks the tires of the four claims Scott Walker is making to Republican voters – that he’s very conservative, that he’s accomplished at winning elections, that he’s courageous in promoting GOP causes, and that he’s a self-made man. Yesterday, per MSNBC’s Alex Seitz-Wald, we learned that Sen. Bernie Sanders is headed to Chicago on April 2 to attend a rally for mayoral candidate Chuy Garcia, who is taking on Rahm Emanuel in the Windy City’s April 7 runoff. It’s the latest example of the liberal-vs.-establishment fight playing out in that Democratic race. Did Kennedy tip his hand in Obamacare case? Finally, when Supreme Court Justice Anthony Kennedy testified on Capitol Hill yesterday, did he tip his hand in how he will vote in King vs. Burwell -- the case involving whether subsidies should be available to states that didn’t establish their own exchanges? Bloomberg: “A representative asked Kennedy about his previously expressed concerns that the court handles many politically charged issues. Kennedy answered by saying that a ‘responsible, efficient, responsive’ Congress and president can alleviate some of the pressure on the court. Kennedy went on: ‘We routinely decide cases involving federal statutes, and we say, “Well, if this is wrong, the Congress will fix it.” But then we hear that Congress can't pass a bill one way or another, that there is gridlock. Some people say that should affect the way we interpret the statutes. That seems to me a wrong proposition. We have to assume that we have three fully functioning branches of the government." The interpretation some are making here: If Kennedy believes Congress should be assumed to be functioning, then he might send the case back to Congress to fix. Then again, Obamacare defenders might argue that if Congress is indeed functioning, shouldn’t its INTENT -- when it passed the law in the first place -- matter most of all?